The building blocks to create your own portfolio tracker. CRYPTOFINANCE connects directly to over 46 exchange APIs to return current market data. New exchanges are added continuously. CRYPTOFINANCE purchased a commercial license from CoinMarketCap and allows 50 calls/day for free. A plan for unlimited data is available too. Because nothing is as flexible as a spreadsheet. Use CRYPTOFINANCE to get historical prices on more than 190 exchanges, or as a VWAP. But also ROI per month, quarter or year. Accountants know their way around a spreadsheet. Make their life easier by providing them your trading journal using CRYPTOFINANCE. Look up your local exchange prices and quickly discover arbitrage opportunities. Follow Bitcoin dominance over time, total marketcap and volume movements, and the number of cryptocurrencies traded on exchanges. CRYPTOFINANCE uses an intuitive syntax to identify which exchanges you want data from. When no exchange is specified it will connect to CoinMarketCap. 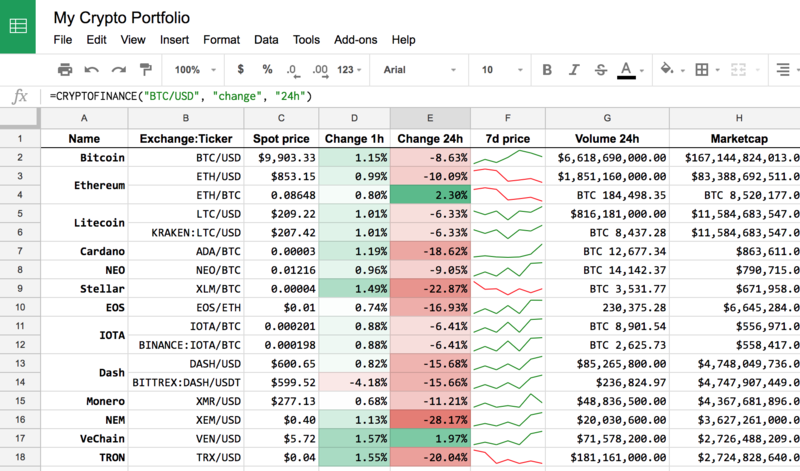 A Google Sheets add-on providing the =CRYPTOFINANCE() function. Free for all supported exchanges latest data. Free for all Coinmetrics data. CoinMarketCap price data (free 50 calls/day, and a plan for unlimited calls). Historical price data from 196 exchanges (free for 25 calls/day, and a plan for unlimited calls). Along with custom function calls to retrieve ROI (Return On Investment) per month, quarter or year. ATH (All-Time-High) prices, date, volume for all markets, and a simple way to display sparklines (mini-inlined charts) in your sheets. For $10/month you access real-time CoinMarketCap data from their new Pro API — over 9 times cheaper than a direct subscription! You will also get an faster refresh interval for exchanges data. The free plan has a 1 hour refresh interval, the Data Availability Service offers a sub-1-minute refresh interval. CRYPTOFINANCE allows me to create sophisticated portfolio models, with the flexibility to precisely tailor my reporting. The support provided is unmatched. I have never had a question unanswered and always left with a greater appreciation for the product. At Virgin we built our novel and unique trading methodology with CRYPTO­FINANCE. It proved to be a key tool in building our crypto strategy. The strategy was shared with other investors outside of Virgin and ultimately contributed to the impro­vement of the cryptoassets management industry as a whole.